Yigal Azrouël launched a new swimwear line to his collection in 2009. Can you say copy cat? Sure I get looking at past designer styles for inspiration, but please, create something individual and expressive. Change it up, just don't steal something so blatantly and then call it your own. 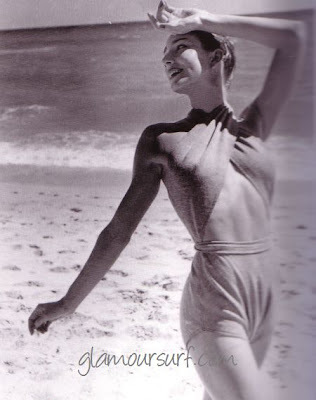 The one below is by Claire McCardell. Photo was shot by Louise Dahl-Wolfe in 1945. Claire uses a wool jersey to drape and create this unique swimsuit which at that time was innovative and completely complimentary to a style that she carried throughout her carreer. Oh lord, then there is another complete rip off. 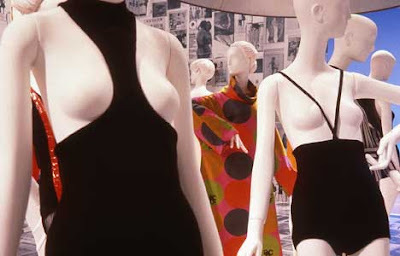 Rudi Gernreich was a master, isn't this just a slap in the face to him? OK, it's different because Yigal added a small bandeau top and used a different material? I just don't think it's ethical. Where are the fashion police? This is the original Rudi Gernreich. Again done in wool. I have tremendous respect for Claire McCardell and Rudi Gernreich, they were pioneers and innovators. Perhaps that is why I react so strongly to this out right duplication. What is old is not new again in this case, it's just wrong. I'm seeing this over and over and over. What a shame! I agree, it's just so blatent!